The #1 free 3D golf game, by TOPGOLF Media, as seen on NBC Sports, Golf Channel, DIRECTV and Fox Sports. 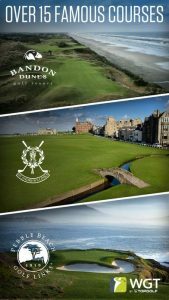 Featuring new Stroke Play on the Front 9 of Pebble Beach; Plus Celtic Manor (2010 Ryder Cup), Bandon Dunes, Chambers Bay and St Andrews from the PGA Tour. This sports game is a full game simulation built with the best GPS and 3D technology. World Golf Tour players can use their existing web accounts and virtual golf equipment. Requires a fast internet connection. Does not support iPad 1, iPhone 3 or iPod Touch 4. Support – Supports iPad 2 or later, iPhone 4, 5 and 6 or later, and iPod Touch 5 or later. Does not support iPad 1, iPhone 3 or iPod Touch 4.